It is no secret that I adore mangoes – raw ones as well as ripe. If you have been reading my blog for a while now, you will know that I love trying out a variety of recipes using mangoes. Each summer, I embark on a hunt for recipes that use mangoes, modern as well as traditional, and try them out in my kitchen. I absolutely love this process, the huge amount of learning I get this way. 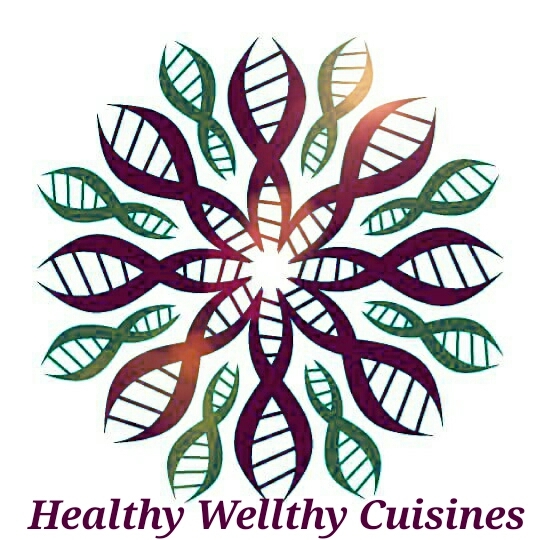 Today, I am here with a collection of the best raw mango recipes from my blog. All of these recipes have been tried and tested to yield beautiful results. Some of these raw mango recipes are from my family cookbooks, things that I grew up eating, while some others are from the Internet or from friends and family. I hope you will try out at least a few dishes from this green mango recipe collection, if you haven’t already. Some of the raw mango recipes featured in this collection! Click on the name of each dish, to get to the relevant recipe! This is such a simple dish to make, but one that tastes absolutely delicious! It barely takes a few minutes to put together, and makes for a different side dish for rotis and rice alike. Try this out with either moong daal or toor daal! Raw mango jam was one of the first-ever jams I made, thrilling me to bits when it turned out so perfect and gorgeous. That beautiful, beautiful colour! Spread it on rotis or bread, and your breakfast is sorted. Krishna Kafe in Koramangala is one place where I absolutely love lunching, and their raw mango sambar is a big-time favourite. That is precisely what inspired me to make this creation. With coconut and other spices ground and mixed in, this sambar is just perfect with piping hot rice and ghee! This is a traditional Maharashtrian dish that my grandma used to make, with chana daal and raw mangoes. It makes for a delish snack any time of the day! It is one of my favourite-st things, ever. The word ‘gotsu‘ inevitably brings to mind a thick gravy, full of coconut, traditionally served in South Indian weddings and other similar occasions. This particular gotsu, though, is different – it is made without coconut and is lighter on the palate, yet extremely flavourful. Try it out with rotis, rice or dosas! This Gujarati raw mango and onion relish will surely have you craving for more! It is an explosion of flavours – sweet and sour and spicy – and is believed to have the power to ward off the ill effects of the extreme heat during the hot summer months. Try it out to believe just how yummy it is! This is a simple recipe for an instant mango pickle that I learnt from my mother-in-law. It can jazz up a dish of plain old curd rice like no one’s business, and it is as easy as 1-2-3! This creation of mine was inspired by a raw mango chaat that I had at a street-side vendor’s, and absolutely loved. The husband and I loved my version, too, sweet and spicy and sour and crunchy and soft, all at the same time. This is an easy-peasy way to make use of leftover rice. The addition of raw mango and dosai milagai podi aka gunpowder takes the taste of this dish to a whole new level. Raw mango and onion salad is a must-order dish for the husband and me, whenever we visit a Thai restaurant. But then, this is such a super-simple dish to make at home too! This is another Thai-style salad that is utterly delectable. What’s more, it is quite easy to make at home, and highly nutritious too. This is the kind of salad I could make a lunch or dinner out of, any day! This is a Tamil New Year specialty – a dish with salty, sour, bitter and sweet tastes in it to signify that life is a mix of many different things, too. We use dried neem flowers to make this dish, as against the fresh ones that are traditionally used. Well, dried neem flowers or fresh, this relish surely is a big-time favourite at home! This raw mango salsa will definitely spice up any party or gathering! Pair it with chips, toast, khakra, lavash or nachos, and watch it work its magic. A lovely appetiser, this is. Is it salsa? Is it chaat? It is both, and an absolutely delicious confection at that! You must try this out when you are craving something spicy and sweet and tangy, and are bored of the regular chaats. If you have all the ingredients handy, it can be whipped up in a jiffy too! This chaat, made with Maharashtrian-style chivda, is elevated to huge heights by the addition of raw mango. It is light and refreshing, and different from the usual, not to forget finger-licking delicious. Try, try! A common sight on the beaches of Tamil Nadu, this sundal is an absolute delight to have. It is a personal favourite, thanks to the punch of flavour it packs in, not to forget just how supremely easy it is to make. Don’t forget to tell me if you try out any of these raw mango recipes! I hope you love these dishes just as much as we did. Have fun creating! Just a short drive away from Kumbakonam, 25 km to be precise, lies the quiet little village of Thirumanancheri in the Nagapattinam district of Tamilnadu. The village has thousands of people flocking to it every day, all thanks to the Kalyana Sundareswarar temple that it houses. It wouldn’t be wrong to call the Kalyana Sundareswarar (‘the beautiful god who facilitates weddings’, in Tamil) temple ‘the temple of marriages’. This temple, where Lord Shiva (along with his wife Goddess Parvati), is the presiding deity, is famed for expediting weddings. A special pooja is performed at the temple for all the visiting male and female devotees who are desirous of marriage – irrespective of whether they are single, divorced or widowed. There are thousands who have entered into matrimony after a visit to this temple, and these couples then visit the temple together to thank God and to light earthen lamps so as to seek His blessings for a happy and long wedded life. Legend has it that, thousands of years ago, it was in the village of Thirumanancheri that Lord Shiva got married to Goddess Parvati, thus granting the place sacred status. This legendary wedding is what, in fact, gives the village its name – ‘Thirumanam‘ means ‘marriage’, and ‘Cheri‘ means ‘village’, in Tamil. Over the years, the Kalyana Sundareswarar temple in the village has become famous for conducting poojas that help weddings happen. Years ago, my husband’s family had prayed at this temple, asking for a suitable wife for him. Coincidentally or not, a year or so later, ‘we’ happened. On our recent visit to Kumbakonam, we drove down to Thirumanancheri, as a married couple, to offer our respects to the deity. Quite late – seven years into our marriage, yes – but we did get to it, finally, with the bub in tow, too. It surely felt good, cute almost, to light lamps together with the husband, at the temple. The bub had a good time of it all, pretty amused to see her Amma and Appa sporting garlands around their necks, as part of the ‘couple pooja‘ at the temple! Considering how famous this temple is, particularly in the south of India, it was pleasing to see that it wasn’t commercial at all, the way a whole lot of temples in India are going these days. Performing the pooja here was a breeze. This is a small and simple, but beautiful, temple, and I hope it stays that way. I hope you have read my other posts about Kumbakonam, and enjoyed them too! If you haven’t, here are the links for you. We are a family of big-time sandwich lovers, if you don’t know that already. I love experimenting with different types of fillings in our sandwiches, and we are known for our sandwich breakfasts, lunches and dinners – basically, we can have sandwiches any time of the day! I would never have thought of adding mango slices to a sandwich, though. That came about solely because I recently came across Nandita Iyer’s Mango Basil Grilled Cheese Sandwiches here, and got super tempted to try them out. Inspired, I made my own version of mango sandwich for dinner a couple of days ago – a chilli and mango grilled cheese sandwich – and it was a huge hit at home. I am positive this is not going to be the last time I have made the sandwich! If you love mangoes, like me, you must absolutely try this sandwich out. I added pickled jalapenos, which everyone knows make for a great combination with cheese. The mango in the sandwich takes the taste several notches higher. Here is how I made this Chilli & mango grilled cheese sandwich. Cut the cheese cubes into thin slices. Keep aside. Skip this step if you are using cheese slices. Cut the mango into thin slices too. Keep aside. Butter all 4 slices of bread. Keep aside. Layer some of the cheese pieces on two slices of buttered bread. Arrange the mango slices on top of this. Arrange the jalapeno pieces and the remaining pieces of cheese on top of the mango. Close the sandwiches using the remaining two slices of buttered bread. Grill the sandwiches in a sandwich maker till slightly crisp. Increase or decrease the quantity of cheese you use in the sandwiches, as per your taste preferences. You could even use ready-made cheese slices to make these sandwiches, instead of cubes. Use mango slices in your sandwiches, if you think you’d like them that way. Increase or decrease the quantity of sliced jalapenos that you use in the sandwiches, as per your personal preferences. I think processed cheese works best for these sandwiches, but you could use any type that you prefer. The original recipe calls for any hot sauce (like Tabasco or green chilli sauce). I used pickled jalapenos instead, and loved the way the sandwiches turned out. If you want to make a healthier version of these sandwiches, you could skip buttering the bread slices, use whole wheat bread, and add lesser cheese. Use a ripe mango that isn’t too squishy, but nice and firm. A mango that is a nice mix of sweet and sour would be great for these chilli & mango grilled cheese sandwiches. Use this recipe sans the mango slices, and you get some gorgeous jalapeño-cheese sandwiches. Yumminess, right? I hope you will make these sandwiches at home, too. If you do, don’t forget to tell me how you liked them! I read Laura Esquivel’s Like Water For Chocolate a few years back. I didn’t like the book much, but scenes from it have stayed in my mind, particularly some food-related ones. I still recall parts of the book where the heroine cooked up magical dishes that had the desired effect upon the eaters, combining ingredients that would have seemed bizarre otherwise. My desire to combine chilli with chocolate began with this book, I think, though I’m not sure. Since this book happened, I have wanted to make something that would combine these two ingredients – chocolate and chilli, sweet and hot – but never took an initiative towards this end. Just recently, though, this foodie dream of mine came to fruition, and my imagination took the shape of a Mexican chilli chocolate ice cream. It turned out beautifully, I must say. This might look like ordinary chocolate ice cream, but it is so not. It is an ice cream that is perfect for times when you want to stun, to surprise, to create an impression. It will, initially, seduce you with its rich, chocolate-ey flavour, then shock you with the hint of chilli in it! And, yet, this Mexican chilli chocolate ice cream is so very simple to prepare – it is just a matter of minutes. Here is how I made the ice cream. Take the fresh cream in a large mixing bowl. Whisk till smooth, without overdoing it. Add the salt, cocoa powder, condensed milk, chilli powder and condensed milk. Whisk gently, until everything is well combined together. Pour this mixture into a clean, dry, air-tight box. Keep the box, covered, in the freezer and set it at the highest temperature. Freeze till the ice cream sets, which should take about 4 hours. Get the ice cream out of the freezer only when you are ready to serve it, because it melts quite fast. Serve immediately. If you do not like the idea of chilli in your ice cream, you could omit the chilli powder and follow the rest of the proceedure. In that case, you would get a pure chocolate ice cream, a lovely rich and smooth one at that. Since I do not own an ice cream maker and am not too fond of churning my ice cream multiple times, I use condensed milk to add creaminess and to help it set beautifully. Adjust the quantity of chilli powder, depending upon how much spiciness you would prefer in your ice cream. Similarly, adjust the quantities of cocoa powder and powdered sugar as per your taste preferences. You could use whipping cream instead of fresh cream, to make the ice cream richer and creamier. That said, this Mexican chilli chocolate ice cream is sinfully creamy and lovely as is. I didn’t want to boil green chillies and add the extract to the ice cream, to flavour it. Neither did I want to add ground green chillies to the ice cream. I have, thus, used red chilli powder to spice it up. You like? I hope you will try out this Mexican chilli chocolate ice cream, too, and that you will love it just as much as we did! 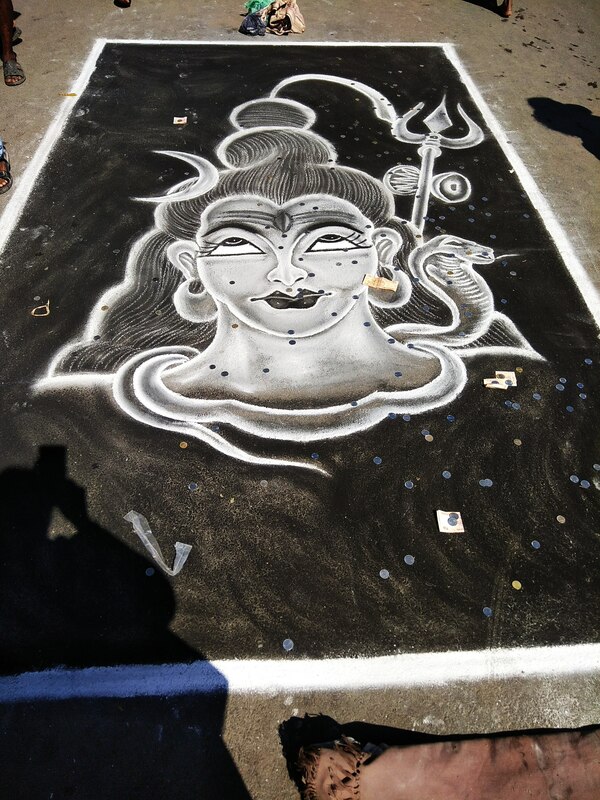 The husband and I mostly travel during festivals, when he manages to get considerable time off work. Lately, we seem to be walking into places only to find ourselves in the midst of big celebrations, surrounded by throngs of people wherever we go. While we are planning our trip, we never know that our destination is a hot-spot for such a major event, and are always taken by surprise. Not good in some ways, but great in some other ways. For instance, we landed in Calcutta in the thick of Kali Pujo, without ever expecting it. Now, recently, we ended up in Kumbakonam in the midst of Masimagam, quite by chance. We planned the Kumbakonam trip around the Hindu festival of Shivratri, and happened to be there right on the auspicious day of Masimagam, when thousands of devotees from across India visit the place, too. Wondering what on earth is Masimagam? Here you go! Masimagam is considered to be a highly auspicious day, particularly in South India. This day is when the planets align a certain way, an incidence that occurs only once annually, generally during February-March, when the Magam star is prevalent during the Tamil month of Masi. On this day, it is believed that all the rivers of India meet at the Mahamagam tank in Kumbakonam, and a dip in the waters of the tank is supposed to cleanse one of all sins. Grand poojas are conducted in all the major temples of Kumbakonam on Masimagam, with processions being carried out on the streets throughout the day. Devotees and holy men from everywhere, as well as tourists, visit Kumbakonam on this day, either to be a part of the bathing ritual or witness and record all of it. Once every 12 years, this day becomes even more special, because of certain planetary alignments. This day is then called Mahamagam, or ‘the great Magam‘ in Tamil, when there are literally millions of people thronging Kumbakonam and clamouring for a dip in the waters of the tank. A few incidences of stampede have been recorded, in Kumbakonam during Mahamagam. The last Mahamagam was in the year 2016. The husband and I had booked a hotel in Kumbakonam very near the Mahamagam tank, quite by chance again. We were in for a big, big, big surprise the minute our auto guy turned towards the tank. There were hundreds of people on the street, many dripping wet from their bath in the tank, with pooja paraphernalia in their hands. Our auto neared the tank, and we were in for an even bigger surprise – the atmosphere there was not unlike a fair! 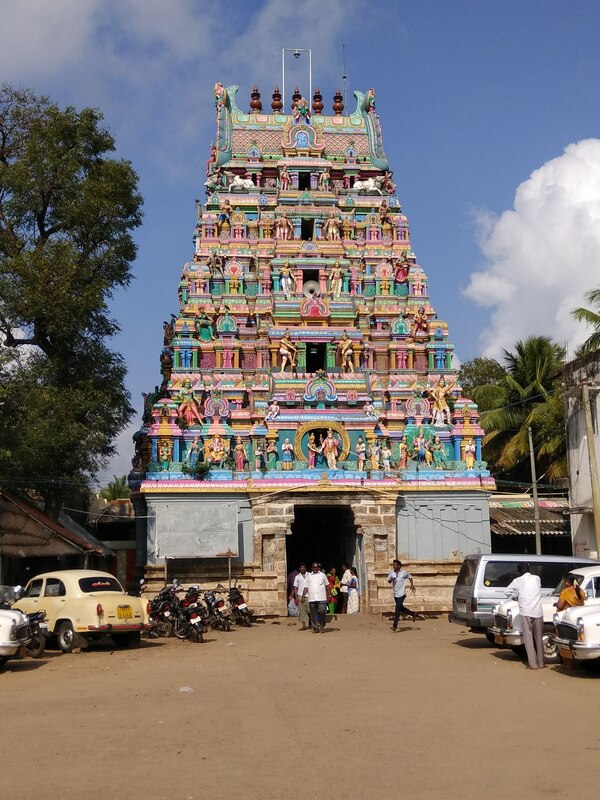 The Kasi Viswanath temple, adjacent to the Mahamagam tank in Kumbakonam. A visit to this temple, especially on the day of Masimagam or Mahamagam, is believed to open the gates of heaven to one. Fruit and vegetable vendors, loudspeakers, police patrolling, flower sellers, people distributing free water and buttermilk, beggars asking for alms, balloon and toy sellers, processions from various temples around town, tourists wanting to photograph every bit of it, devotees vying to get a dip in the tank.. it was BUSY, for sure. And, it was super-duper hot! Devotees taking a dip in the holy waters of the Mahamagam tank. Can you see how dense the crowd is? We walked around with the bub, slowly, soaking in the atmosphere around us, taking pictures, committing things to memory. We didn’t dip ourselves in the holy water, but enjoyed every bit of the looking around we did, getting to know more about this important cultural event in South India. What saddened us a whole lot, though, was the piles and piles and piles of garbage left around the Mahamagam tank, by evening, when the rituals had slowed down and the streets had started emptying. I heartily wish this could be changed, for the better, about ceremonies like this. Have you read my other posts about our visit to Kumbakonam? I hope you have! If you haven’t, though, here you go! On our trip to Madurai, we aren’t able to fit in a visit to the Azhagar Kovil, about 20 km away from the main city. We do, however, visit the other Azhagar Kovil – the Koodal Azhagar Kovil – which is just a short distance away from the famed Meenakshi Amman temple. Legend has it that all the Gods and Goddesses got together at the Koodal Azhagar temple, for Meenakshi Amman’s wedding to Lord Sundareswarar. That is how the temple got its name, I understand – ‘koodal‘ refers to ‘gathering’ in Tamil. The ‘Azhagar‘ (‘beautiful lord’ in Tamil) here refers to Lord Vishnu, the presiding deity in the temple. For the locals, though, the Koodal Azhagar temple is ‘Perumal Kovil’ or ‘the lord’s temple’. The Koodal Azhagar temple is a lovely, ancient place, engulfing us with its aura of peace and reverence the minute we enter. How can we not feel awed, charmed, knowing that we are walking on sacred ground that has existed since the 7th century BCE? I have no pictures of the inside of the temple, though, as photography is not permitted within. I don’t want to snap away inside a place of worship, anyway. Inside the temple, we find dosais being sold as prasadam, and I get one immediately. ‘So what if I cannot get my hands on the Azhagar Kovil dosai on this visit? I can try out the Koodal Azhagar dosai,’ I tell myself. The ‘dosai’ we are handed, in a square of newspaper, doesn’t look like a dosai at all. It is hard and chewy, beautiful in taste, redolent of black pepper. We munch on it, bit by little bit, sitting in the huge temple courtyard. It’s a tad tough to eat, but tasty nonetheless. I’m not sure if this dosai is the same as the famous Azhagar Kovil dosai, since I have never seen or tasted the latter. Maybe this is a version of the original? I have no clue. For now, I’ll call this the ‘Koodal Azhagar dosai‘. Last weekend, I did something that I’d been wanting to do for a very, very long time – I made a cheesecake! Now, I haven’t ever made cheesecake before (I have made bhapa doi the OPOS way, but never a proper cheesecake), so I was all excited when I set out. I was super confused about how to proceed too, so I turned to the Internet for help. I am not a big fan of the satiny-smooth, all-sweet texture of cheesecakes that you commonly get in bakeries. I wanted something simpler, more homely, more rustic in looks and taste, something that wouldn’t call for ingredients like gelatin or agar-agar. I finally zeroed in on this recipe by AnnaParabrahma – a cheesecake recipe that uses no agar-agar or gelatin, but hung curd and condensed milk instead. I mostly followed the original recipe, and the hung curd cheesecake turned out absolutely lovely, far better than I had expected it to be. It tasted so very lovely, sinfully decadent, that it got over within minutes of the making. It wasn’t perfect, but hey, it was my first and was super special! Now, let’s get on to the recipe part, shall we? Here’s how I made the hung curd cheesecake. Make the base first and then go on to prepare the cheesecake filling, while your base gets freezing in the refrigerator. Break the biscuits using your hands, and drop the pieces into a mixer. Pulse for a couple of seconds, or till the biscuits turn into a powder. Transfer the biscuit powder to a large mixing bowl. Add butter, one tablespoon at a time, and mix using your hands. Check consistency after you add each tablespoon of butter and mix it in – stop adding butter when you feel the biscuit powder has reached the texture of wet sand. Keep aside. Line a medium-sized baking tin with aluminium foil or parchment paper, leaving a bit of the foil or paper hanging out (this will help you lift the cheesecake out). Gently spoon in the biscuit-butter mixture at the bottom of the lined baking tin. Make sure that the mixture is spread evenly, and that there are no gaps. Don’t pack in the mixture too tightly – just spoon it in gently. Cover the baking tin and set it in the freezer while you proceed to make the cheesecake filling. Take the hung curd in a mixing bowl. Whisk until smooth and creamy. Add the vanilla essence, lemon juice and condensed milk to the bowl. Whisk everything together until thoroughly combined. Once your filling is ready, get the cheesecake base out of the freezer. Uncover. Pour the filling over the base, evenly. Smooth the top, using a spoon, till even. Cover again, and put in freezer. Set freezer at highest temperature. Let the cheesecake freeze overnight. The next morning, or whenever you are ready to serve the cheesecake, get it out of the freezer. Uncover. Remove onto a serving plate, carefully, using the aluminium foil or parchment paper that you lined the tin with. Remove all traces of the foil or parchment paper from the cheesecake. Pour the strawberry syrup evenly over the top of the cheesecake. Cut the cheesecake and serve immediately. Use the butter at room temperature only. I have used whole wheat biscuits to make the base here, instead of the commonly used digestive cookies. Take your pick! Resist the temptation to add a whole lot of butter to the base. That will only make the biscuit dough (for the cheesecake base) quite firm and, after you freeze it, really hard. Stop adding butter when the biscuit powder reaches the consistency of wet sand, like I said earlier. Don’t bind it into a firm dough. Remember that the base will set further on freezing and get harder. Like I said earlier, gently spoon in the biscuit-butter mixture at the bottom of the baking tin. Don’t pack it in too tightly – that will make the base very hard. A springform tin works best to make this cheesecake, so that all you have to do after the cheesecake is set is open the latch and unmould it. However, if you do not own a springform tin, an ordinary baking tin suffices too – just line it with foil or parchment paper so that it is easier to lift the set cheesecake out the next day. Use thick curd that is fresh and not too sour, to make this cheesecake. You can use any flavour of syrup, of your choice, to top the cheesecake. If you are using strawberry syrup to top the cheesecake, you could use strawberry essence for the filling too, instead of vanilla. Get the cheesecake out of the freezer only when you are ready to serve it. Apparently, mixing lemon juice with the condensed milk and hung curd helps the cheesecake set better. This is of utmost importance, considering you are not using agar-agar or gelatin to set the cheesecake. This recipe will give you a rather rustic, slightly sour-tasting but delish cheesecake, which will not have the smooth sheen or texture of a bakery-bought one. Do try out this easy hung curd cheesecake recipe, will you? And don’t forget to tell me how it turned out! Kapoor’s Cafe, Now At HSR Layout! After a successful innings in Whitefield (one outlet in Thubarahalli and one on ITPL Road), Kapoor’s Cafe launched a third outlet in HSR Layout recently. I was delighted to be given the opportunity to be part of the new outlet’s launch party, considering that I loved the food at the ITPL Road branch. Dhol at the Kapoor’s Cafe launch party! The HSR Layout outlet opened to much dhol beating, dancing, Punjabi-style fanfare and, of course, food! The new Kapoor’s Cafe branch is located on the bustling 27th Main in HSR Layout, and finding it is, really, a no-brainer. The cafe is spread over two floors, with regular table-and-chair seating on one and khatiya/charpoy seating on the other, a la highway dhabas. I think the dhaba-style seating is the best part of the cafe, a highlight for sure. We chose to dine here and, I must say, it is quite a different, beautiful experience to eat that way! The ambience of the khatiya seating area is something else altogether – with handmade lanterns, bamboo haath-pankhas, and framed posters proclaiming things like ‘I am Punjabi, and I cannot keep calm!’. Kapoor’s Cafe serves typical North Indian fare, all-vegetarian. The place is famous for its various combo thalis and thick, malai maar-ke dryfruit lassi. The evening of the launch party, we were served chaach (buttermilk) and their famous dryfruit lassi in huge earthen glasses, which lent a lovely feel to them. As always, I loved the lassi, which I think is a must-try, rich and cool and fragrant and utterly refreshing. Post this, we were served assorted pakoras – cauliflower, paneer, cheese and onion. I loved the onion and cheese ones best, though the latter was a tad spicy for my tastebuds. It was oozing with melted cheese – what’s to not love? The paneer and cauliflower pakoras were just okay. For main course, we were served dal makhani, aloo (potato) raita, matar (green peas) pulao, pindi chole and paneer lababdar, accompanied by missi roti and phulkas. I heartily loved the dal makhani and matar pulao, simple but soul-satisfying. The pindi chole, paneer lababdar and aloo raita had a beautiful taste, but were way too spicy for me to eat comfortably. The menu does contain a warning for people with a low threshold for spices (like me), which I saw only too late. Oh, well, next time! The missi roti was lovely, while the phulkas could have been thinner. We also got to sample their cheese paratha, which tasted good, but was not outstanding. For dessert, we were served their signature fruit cream, which I felt was a few notches lower in taste than the brilliant fruit cream I have tasted at their ITPL Road outlet. For lovers of North Indian food, this cafe is definitely a must-visit. Kapoor’s Cafe has a lot of combos and more to offer its patrons. I’d love to visit again, especially this particular branch, to try out more of their offerings. After I had tried out making cottage cheese with herbs, I wanted to make a sweet version of the same. Just then, I came across a recipe for orange-infused paneer with dried fruits and nuts by the super-talented Chef Bejaya Sinha on the Chef At Large Facebook group, and absolutely had to try it out. I did just that, recently, with a few changes of my own, and was stupefied by the end result. I used fresh juice from oranges (available in abundance now) to make the paneer (instead of the vinegar I use regularly), and added chopped dried fruit and nuts in, too. I doused the milk solids with some powdered sugar as well. The cottage cheese turned out gloriously sweet and soft, smelling beautifully of oranges. Orange-infused dry fruit and nut paneer! This paneer tasted great as is, but tasted even better toasted, lightly dusted with more sugar. I am guessing it would taste great in salads as well as in sweet dishes too, but I didn’t try any of these things out. If you guys have ideas on how one can use this sweet paneer, I’d highly appreciate it. Now, let’s move on to the recipe, shall we? Set the milk to boil, on high flame, in a heavy-bottomed vessel. When the milk has heated up for a couple of minutes, add in the chopped figs and pistachios. Continue to heat the milk. When the milk reaches the almost-boiling stage i.e. when it starts forming a layer on top and bubbles start forming at the sides, switch off the gas. Add the orange juice, bit by bit. If the milk hasn’t started curdling by now, add in the lemon juice, a little bit at a time. Mix well. Let the milk sit, undisturbed, for 2-3 minutes. By this time, the milk should have fully curdled and a watery whey should have separated from the solids. Meanwhile, line a colander with a fine cotton cloth. After 2-3 minutes, pour the entire contents of the vessel into the cloth-lined colander, placing another vessel below it to catch the whey. The whey will gush into the vessel into the bottom, while the milk solids will stay in the cotton cloth. When most of the whey has drained out, mix in the powdered sugar into the milk solids resting in the cotton cloth. Let them sit this way for a couple more minutes, and then place the cloth (with the solids in it) into a round or square box to give the cottage cheese shape. The whey will continue to drain out during this process, but in very little quantity. Let the cottage cheese rest in the box for about 5 minutes, by which time it will cool down. Then, you can transfer the cottage cheese to a clean, dry, air-tight box. Keep the paneer refrigerated till you use it. I used the dried fruits and nuts that I had on hand, to make this paneer. You could use any dried fruit/s or nut/s of your choice. Adding the orange juice and lemon juice a little bit at a time (as opposed to all of it at one shot) will help you make paneer that is soft. You could use honey to sweeten the paneer too, if you do not want to use sugar. Remember to add the powdered sugar at the very last stage, when most of the whey has drained out of the milk solids. Otherwise, the sugar will not get incorporated in the paneer very well. Refrigerated, this paneer stays well for about 5 days. It is best to consume the paneer within that time frame, since we are not using any preservatives. You like? I hope you’ll try this out too! About 20 km away from Madurai, the Kallu Azhagar temple stands in the foothills of the lush Azhagar Malai (‘beautiful hills’ in Tamil). 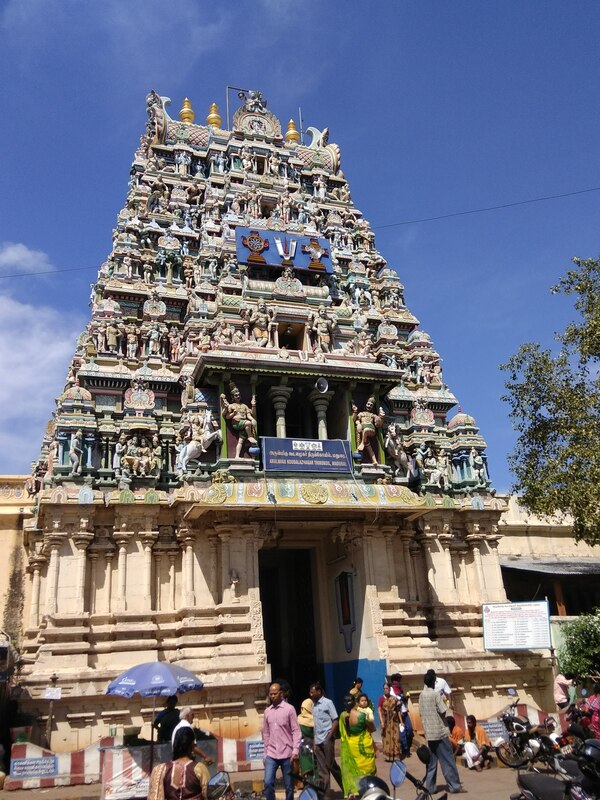 Lord Vishnu, the presiding deity of this temple, is believed to be the brother of Meenakshi Amman (the Goddess of the famed Madurai Meenakshi Amman temple), and it was he who gave the goddess’s hand in marriage to Lord Shiva (Sundaresan). The Kallu Azhagar temple is popularly called the Azhagar Kovil (‘temple of the beautiful one’, in Tamil), and local legends abound as to how the place got its name. There seems to be no doubt, however, about just how serene and picturesque the temple and its surroundings are. Before embarking on our recent trip to Madurai, I came across quite a few blog posts about the temple, each one talking about how beautiful and peaceful a place it is. No wonder, then, that the Kallu Azhagar temple happens to be a favourite weekend picnic destination for Madurai locals and tourists alike. Being the big foodie that I am, the one thing that leapt out from these many blog posts and grabbed my attention was the mention of Azhagar Kovil Dosai – a special kind of dosa that is prepared with black urad daal and ghee, spiced with black pepper, which is offered to the deity in the Kallu Azhagar temple and then offered to the devotees as prasadam. I have never come across dosas being offered as prasadam in any temple, ever, so this intrigued me, not to forget several people claiming that this dosa is stupendously delicious and guaranteed to disappear within minutes of the making. Sadly, though, on our holiday, we just weren’t able to squeeze out time to visit the temple, and all my dreams of partaking of this beautiful-sounding prasadam remained just that – dreams. Azhagar Kovil Dosas, at home! Since I had no clue about the recipe, I sought help from the Internet, which gave me many different versions. In the end, I decided to make the dosas using one step from this recipe, one step from that. Here is how I made the Azhagar Kovil dosais. Soak the raw rice and parboiled rice together, in enough water to immerse them completely, for at least 8 hours. I soaked them overnight. Soak the black urad daal in enough water to immerse it fully, for at least 8 hours. I soaked it overnight. When the soaking is done, drain out the excess water from the rice as well as the black urad daal. Using a mixer, grind the urad daal to a fine paste. There’s no need to add water, but you could add a little water if required. Pour the batter into a large vessel. (If you are using whole peppercorns, add them in while grinding the urad daal). In the same mixer, grind the pieces of ginger, grated coconut, raw rice and parboiled rice together, coarsely. There’s no need to add water, but add a little if required. Pour this batter into the large vessel too. Now, add salt to taste, pepper powder and cumin seeds to the batter in the large vessel. Roughly tear the curry leaves with your hands, and add them to the batter. Mix everything well, ensuring that all the ingredients are thoroughly combined together. Set the batter to ferment, covered, in a cool and dry place, away from direct sunlight. This takes barely 3-4 hours in hot weather and 6-8 hours or even overnight in colder climes. You will know the batter has fermented when it has become bubbly and has risen. Once the batter has fermented, you can keep it, covered, in the refrigerator, for later use, or proceed to make dosas immediately. To make the dosas, heat a dosa pan on high flame till water droplets dance on it. Spread a ladleful of batter in the centre of the pan, spread it out and add about 1 teaspoon of ghee all around the dosa. Reduce flame to medium. Let the dosa cook for a couple of minutes, and then flip. Cook on the other side for a minute or so. Serve the dosas hot with chutney, sambar or gotsu. You could use oil (preferably sesame oil) to make the dosas instead of ghee. Traditionally, though, ghee is used to make these dosas. You could use either whole or halved black urad daal to make these dosas. I used the halved ones. It is critical to use black pepper powder and black urad daal, which are what give these dosas their distinct, slightly black, colour. I have used a mix of parboiled rice and raw rice to make these dosas, but the original ones from the temple use only raw rice (since parboiled rice is believed to be rice already cooked, which isn’t acceptable to make temple prasadam). I think the dosas made with only raw rice would be a tad chewy, while the addition of parboiled rice make them softer in texture. You could use whole peppercorns to make these dosas, too, instead of pepper powder. In that case, just add them in while you are grinding the batter. I doubt the original Azhagar Kovil dosas contain coconut. I decided to add it, to add flavour to the dosas. Once the batter has fermented, do not keep the batter outside for too long, otherwise it will turn sour. Keep the batter refrigerated, if you don’t plan on using it immediately. This might not be the original Azhagar Kovil dosai recipe; it might come close, but this might not be it. This is my version of the recipe, based on several different posts by several different people. You like? I hope you will try making these dosas, too, and that you will love them just as much as we did!